Samsung is not, it would seem, a brand that likes chasing anyone. It seems almost obsessed with being the pace setter, the race leader, not the valiant runner up. This obsession has seen the brand invest vast amounts of research and development time in recent years in successfully hunting down seemingly unassailable rivals in the smartphone, tablet and LCD TV sectors. Now, if the Samsung PS64F8500 plasma TV is anything to go by, Samsung's ruthless quest for world dominance now has a new quarry in its sights: Panasonic. Or more specifically, Panasonic's long-revered plasma TVs. Samsung is hardly a plasma virgin, of course. It's served up numerous plasma television hits before. However, these previous plasma successes have mostly traded on value for money - when it comes to absolute picture quality, Panasonic has remained the king of the castle. With the Samsung PS64F8500, though, the brand gets so close to upsetting this established order that you can practically hear Panasonic's teeth chattering. As its name suggests, the Samsung PS64F8500 is a 64-inch TV - a damn fine size for movie fans, and a heck of a lot of television to be getting for a full price of £2,999.99 (around AU$4,620/US$4,575). What's more, despite its very respectable price the Samsung PS64F8500 is no feature lightweight. On the contrary, its highlights include active 3D playback, a comprehensive multimedia playback system, a full iteration of Samsung's latest startlingly powerful and flexible smart TV/online platforms and a much more refined and uncompromising plasma panel design than anything the brand has unleashed before. You can even wave your hands at and talk to the TV if you want to - things we've not previously felt inclined to do, to be honest, but which suddenly, thanks to recent significant firmware updates from Samsung's seemingly tireless engineers, have started to make sense. Despite Samsung putting so much effort into the PS64F8500, the TV doesn't sit at the head of a long line of cheaper plasma models, as you might expect. 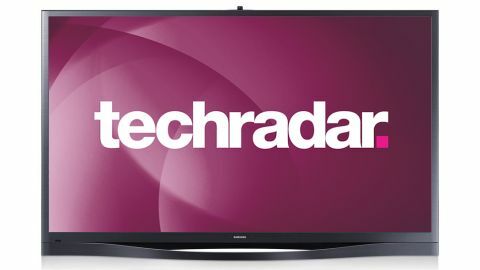 There's a 51-inch 8500 model that costs £1,899.99, but aside from that your only Samsung plasma options are the 60-inch and 51-inch F5500 models - priced at £1,299.99 and £899.99. These use less high-grade panels and video processing, don't have built-in cameras and don't support voice or motion control. If you'd rather have a Samsung LCD TV, the obvious options to consider would be the brand's flagship F8000 LCD TVs - a range of outstanding sets that currently top out at 55 inches but will ultimately be joined by 65-inch and 75-inch models. But you should note that the biggest two models in this series will likely be far more expensive than the Samsung PS64F8500. So far as rival sets from other brands are concerned, the inevitable competition will be Panasonic. Where models we've already tested are concerned, the closest option is the Panasonic P65VT50. But we'll also soon be looking at the brand new Panasonic P65VT65 and flagship Panasonic P60ZT65 models.